The Benjamin A. Gilman International Scholarship Program provides scholarships to U.S. undergraduates with financial need for study abroad, including students from diverse backgrounds and students going to non-traditional study abroad destinations. The Gilman Scholarship Program broadens the student population that studies and interns abroad by supporting undergraduates who might not otherwise participate due to financial constraints. The program aims to encourage students to choose non-traditional study and intern destinations, especially those outside of Western Europe, Australia and New Zealand. 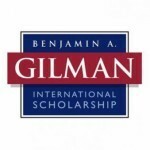 The Gilman Scholarship Program aims to support students who have been traditionally under-represented in education abroad, including but not limited to, students with high financial need, community college students, students in underrepresented fields such as the sciences and engineering, students with diverse ethnic backgrounds, and students with disabilities. The program seeks to assist students from a diverse range of public and private institutions from all 50 states, Washington, DC and Puerto Rico. Award recipients are chosen by a competitive selection process and must use the award to defray eligible study or intern abroad costs. These costs include program tuition, room and board, books, local transportation, insurance and international airfare. Students who apply for and receive the Benjamin A. Gilman International Scholarship to study abroad are then eligible to receive a Critical Need Language Award from the Gilman Scholarship Program of $8,000. Applicants who are studying a critical need language while abroad will automatically be considered for the Critical Need Language Award. During the 2011-2012 academic year, 50 Critical Need Language Awards were offered to Gilman Scholarship recipients. The scholarship program is open to all U.S. citizen undergraduates, in good academic standing who have received a Federal Pell Grant and meet the following criteria. Receiving a Federal Pell Grant or provide proof that he/she will be receiving a Pell Grant at the time of application or during the term of his/her study abroad. For full eligibility details, an application form, and further information, please check the IIE website. Apply for the Benjamin A. Gilman Scholarship through Institute of International Education (IIE). Complete the online application by visiting the IIE website.